A freshly painted Enfield Police Department truck is now on the streets, following its former life as a Halifax EMC fleet vehicle. In 2016, the Enfield Police Department had a need for a truck with towing capability, which Halifax EMC met by donating a 2000 Ford F-150 pickup truck. 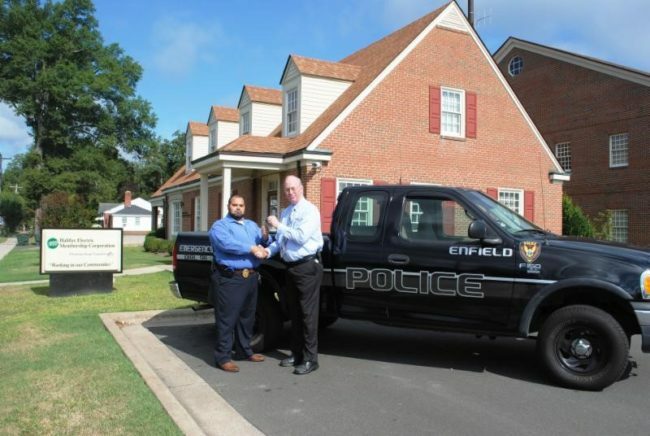 The Enfield Police Department recently had the truck repainted and striped to match the department’s patrol cars. The truck allows the department to tow its 16-foot enclosed trailer, which is often utilized to recover larger-sized stolen items that can’t fit in patrol cars. The truck will also be useful during inclement weather duties. It has already been used for the police department’s donation drive for the survivors of Hurricane Harvey in Texas, according to Captain Dreher Bozard. Chief Tyree Davis of the Enfield Police Department accepts the keys to the truck from Charles Guerry. In previous years, Halifax EMC has given away old work trucks as door prizes at its annual meeting. Helping out the police department just seemed like the right thing to do, according to the co-op. “We would like to publicly and personally thank Halifax EMC for their generosity and their contribution towards public safety for the community of Enfield,” Bozard said.